From a cup of coffee or tea to a full-blown banquet, Betton Farm Tea Rooms and Restaurant offers something for everybody seven days a week all year round. 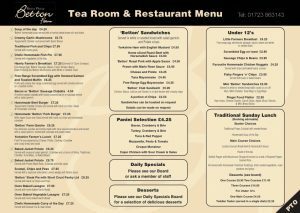 Choose from our comprehensive All Day menu with Seasonal Daily Specials cooked to order using fresh local produce whenever possible. A full range of freshly made sandwiches, panini, snacks, tray-bakes, biscuits and Betton home-made cakes can be enjoyed at any time of the day as can our speciality coffee’s, Yorkshire teas, ice creams and delicious desserts. We are fully licensed for the sale of beers, spirits and wines so… be really indulgent and order a bottle of Prosecco to accompany our famous “Betton Farm Afternoon Tea” served with a choice of sandwiches, delicious cakes and scones and clotted cream freshly baked every day in our on-site bakery! Why not treat the family to our popular “Traditional Yorkshire Sunday Lunch” One Course! Two Course! Three Course or even a “toddler taster” – the choice is yours! It is always best to book your table so as not to be disappointed. We endeavour to cater for all dietary needs, all tastes and for all ages. If it’s not on the menu – just ask our friendly staff and they will do their very best to help you. Whatever the time of year the views across the Vale of Pickering to the Yorkshire Wolds are fabulous. In summer enjoy peace and quiet on our (child free) garden terrace or enjoy alfresco family fun on our sunny patio courtyard. 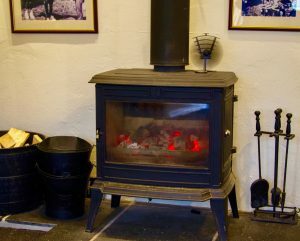 In winter, a log burning stove welcomes visitors to the cosy tea room restaurant. Not sure about our menu or would like to book a table? Contact us!